In this guide, we will show you how to change the default program associated with a particular file type within Ubuntu. There are multiple ways to achieve this goal and we will present the two easiest options. You can change the default programs for the following file types from the details screen within the Ubuntu settings. 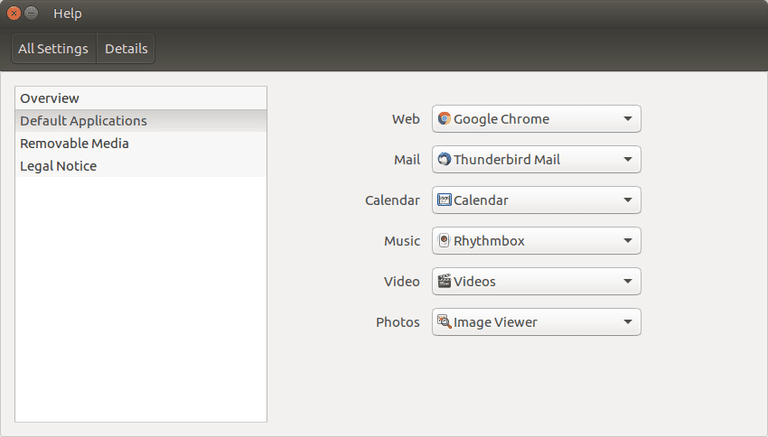 To do so click the icon on the Ubuntu launcher which looks like a cog with a spanner going through it. From the "All Settings" screen click on the details icon which is on the bottom row and also has a cogs icon. To change one of the settings click on the drop-down arrow and choose one of the other options available. If there is only one option it means you don't have a relevant alternative available. Click on the "Removable Media" option from the "Details" screen. By default, all of them are set to "Ask what to do" except for "Software" which is set to run the software. Clicking on the drop-down for any of the options provides a list of recommended applications to run for that option. The "Other application" option brings up a list of all the applications installed on the system. You can also choose to find an application which takes you to the Gnome Package manager. If you don't want to be prompted or you don't want any action to occur when you insert media check the "Never prompt or start programs on media insertion". The final option on this screen is "Other Media...". An alternative way to choose a default application is to use the "Files" file manager. Click on the icon that looks like a filing cabinet and navigate through the folder structure until you find a file that you wish to change the default application for. For instance, navigate to the music folder and find an MP3 file. Right-click on the file, select "open with" and then either choose one of the applications listed or choose "other application". A new window will appear called "Recommended Applications". You can choose one of the recommended applications listed but you could have done that from the "open with" menu. If you click the "View All Applications" button a list of every application will be shown. The chances are that none of these are relevant to the file type you are using otherwise it would be listed as a recommended application. A better button to use is the "Find New Applications" button. Clicking this button brings up the Gnome Package Manager with a list of relevant applications for that file type. Look through the list and click install next to the program you wish to install. You will need to close the Gnome Package Manager after the application has installed. You will notice that the recommended applications now contains your new program. You can click it to make it the default.